Photosynthesis takes place in two stages: the light-dependent reactions and the Calvin cycle. In the light-dependent reactions, which take place at the thylakoid membrane, chlorophyll absorbs energy from sunlight and then converts it into chemical energy with the use of water. The light-dependent reactions release oxygen from the hydrolysis of water as a byproduct. In the Calvin cycle, which takes place in the stroma, the chemical energy derived from the light-dependent reactions drives both the capture of carbon in carbon dioxide molecules and the subsequent assembly of sugar molecules. The two reactions use carrier molecules to transport the energy from one to the other. The carriers that move energy from the light-dependent reactions to the Calvin cycle reactions can be thought of as “full” because they bring energy. After the energy is released, the “empty” energy carriers return to the light-dependent reactions to obtain more energy. How can light be used to make food? It is easy to think of light as something that exists and allows living organisms, such as humans, to see, but light is a form of energy. Like all energy, light can travel, change form, and be harnessed to do work. In the case of photosynthesis, light energy is transformed into chemical energy, which autotrophs use to build carbohydrate molecules. However, autotrophs only use a specific component of sunlight (Figure 7). The sun emits an enormous amount of electromagnetic radiation (solar energy). Humans can see only a fraction of this energy, which is referred to as “visible light.” The manner in which solar energy travels can be described and measured as waves. 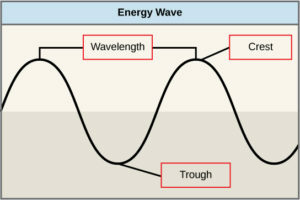 Scientists can determine the amount of energy of a wave by measuring its wavelength, the distance between two consecutive, similar points in a series of waves, such as from crest to crest or trough to trough (Figure 8). Figure 8 The wavelength of a single wave is the distance between two consecutive points along the wave. Visible light constitutes only one of many types of electromagnetic radiation emitted from the sun. The electromagnetic spectrum is the range of all possible wavelengths of radiation (Figure 9). Each wavelength corresponds to a different amount of energy carried. Figure 9 The sun emits energy in the form of electromagnetic radiation. This radiation exists in different wavelengths, each of which has its own characteristic energy. Visible light is one type of energy emitted from the sun. The sun emits (Figure 9) a broad range of electromagnetic radiation, including X-rays and ultraviolet (UV) rays. The higher-energy waves are dangerous to living things; for example, X-rays and UV rays can be harmful to humans. Different kinds of pigments exist, and each absorbs only certain wavelengths (colors) of visible light. Pigments reflect the color of the wavelengths that they cannot absorb. All photosynthetic organisms contain a pigment called chlorophyll a, which humans see as the common green color associated with plants. Chlorophyll a absorbs wavelengths from either end of the visible spectrum (blue and red), but not from green. Because green is reflected, chlorophyll appears green. Many photosynthetic organisms have a mixture of pigments; between them, the organism can absorb energy from a wider range of visible-light wavelengths. 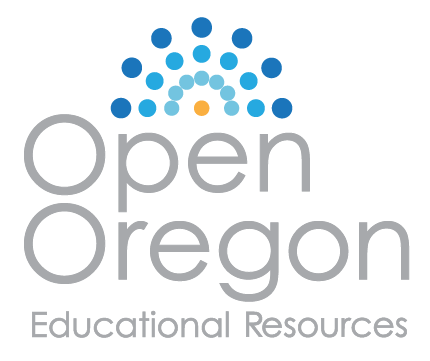 Not all photosynthetic organisms have full access to sunlight. Some organisms grow underwater where light intensity decreases with depth, and certain wavelengths are absorbed by the water. 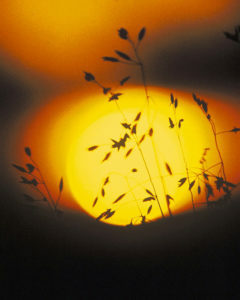 Other organisms grow in competition for light. 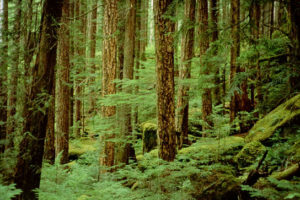 Plants on the rainforest floor must be able to absorb any bit of light that comes through, because the taller trees block most of the sunlight (Figure 10). A photon of light energy travels until it reaches a molecule of chlorophyll. The photon causes an electron in the chlorophyll to become “excited.” The energy given to the electron allows it to break free from an atom of the chlorophyll molecule. Chlorophyll is therefore said to “donate” an electron (Figure 11). Figure 11 Light energy is absorbed by a chlorophyll molecule and is passed along a pathway to other chlorophyll molecules. The energy culminates in a molecule of chlorophyll found in the reaction center. The energy “excites” one of its electrons enough to leave the molecule and be transferred to a nearby primary electron acceptor. A molecule of water splits to release an electron, which is needed to replace the one donated. Oxygen and hydrogen ions are also formed from the splitting of water. 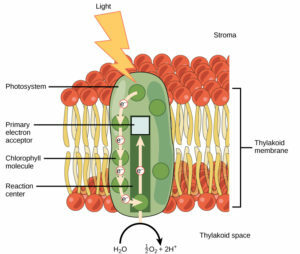 After the photon hits, photosystem II transfers the free electron to the first in a series of proteins inside the thylakoid membrane called the electron transport chain. 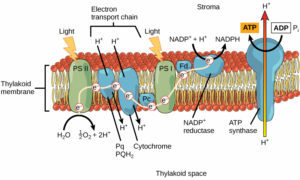 As the electron passes along these proteins, energy from the electron fuels membrane pumps that actively move hydrogen ions against their concentration gradient from the stroma into the thylakoid space. This is quite analogous to the process that occurs in the mitochondrion in which an electron transport chain pumps hydrogen ions from the mitochondrial stroma across the inner membrane and into the intermembrane space, creating an electrochemical gradient. After the energy is used, the electron is accepted by a pigment molecule in the next photosystem, which is called photosystem I (Figure 12). Figure 12 From photosystem II, the electron travels along a series of proteins. This electron transport system uses the energy from the electron to pump hydrogen ions into the interior of the thylakoid. A pigment molecule in photosystem I accepts the electron.